I hear ya with the funeral potatoes, but I’m not fond of cornflakes. I like ritz crackers instead. I have never heard of those? One thing….that is hard. I would have to say POPCORN!!Yummy! The practical side of me says low fat strawberry yogurt–sweet but with some nutritional benefits. The honest side of me says CHOCOLATE CAKE! I’m going to have to ask my sister-in-law about those potatoes.I’d have to say…salad with grilled chicken. yum. Those taters look pretty good, and if I had ever tried them, I might pick them, but since I haven’t, I’ll say tacos. HEY!! I’m making those tonight for Jake’s Birthday meal!! It would be my dying meal too and maybe that’s why they are “funeral potatoes”?? cheeseburgers for me! although i can’t pass up a big helping of funeral potatoes! oh! Me too! Me too! 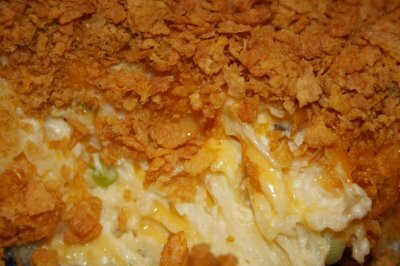 Funeral Potatoes are just one of the things I will always be gratefull to Matt for. Yummy!